Felt Z5, ca. 2012. All Shimano 105. The Giant OCR1 that got me back into serious cycling eventually became a chore to ride. The aluminum frame transmitted a lot of road chatter, which translated to sore muscles and stiff bones after long rides. I’m not, after all, getting younger. So I began looking for bicycles with more forgiving rides. Initially, I believed I wanted a steel frame bike, partly for nostalgic reasons, but good quality steel tubing from companies such as Reynolds and Columbus offer more forgiving rides than the aluminum used in the OCR1. Then I read about carbon fiber frames, and that material’s ability to soak up road vibration. I initially resisted the idea, but after test riding a number of steel bikes which seemed to offer only marginal improvements to the Giant, I test rode a few carbon fiber frames. My real problem with all these bikes was cost: carbon fiber bikes cost considerably more than those built with steel or aluminum. 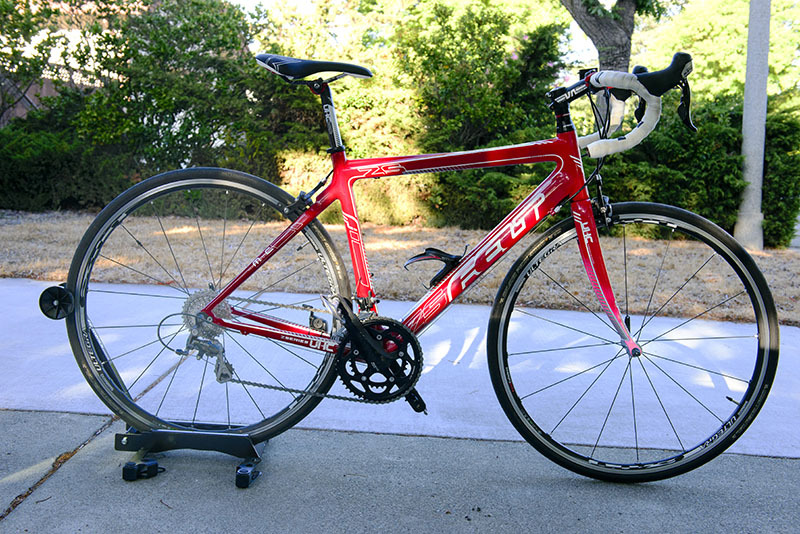 Then I came across this bright red, 2012 Felt Z5 at the Cupertino Bike Shop. Ostensibly $2,200, the shop cut the price to $1,799. I took the Z5 out for a spin, and really liked the way it felt. The 2012 model sported full Shimano 105 components throughout, including a 50/34 compact crank and a 12-28 tooth rear cassette. Next year’s model would be priced lower, but Felt would also drop the overall component quality. So the 2012 model proved to be something of a sweet spot. Garmin 500, in matching red! 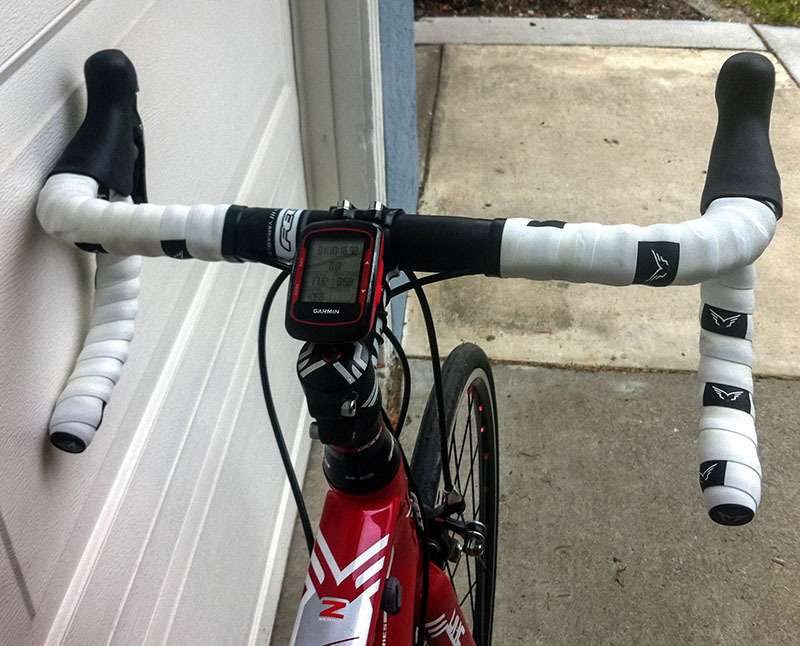 I immediately added a Garmin Edge 500, my second attempt at adding a cycling computer. The first attempt involved a terrible Cateye gizmo that never quite worked correctly. The 500’s setup turned out to be dead simple, and the sensor plus antenna module mounted perfectly on the chainstay. I used the supplied Garmin mounting hardware, which involved stretchy rubber bands (o-rings, really), to attach the mount to the stem. I rode the Z5 for about 18 months, for rides up to 26 miles, and regularly rode 20 or more miles on a ride. The z5 falls into the endurance bike category, which means a longer wheelbase and slightly more upright seating posture. I later found out that some riders consider the overall ride quality of the Z5 a little unforgiving for an endurance frame, but it was such an improvement over the OCR1, I loved it initially. The tradeoff for slightly more buzzy ride quality was handling: the Z5 steering was precise and easy, even at relatively higher speeds. 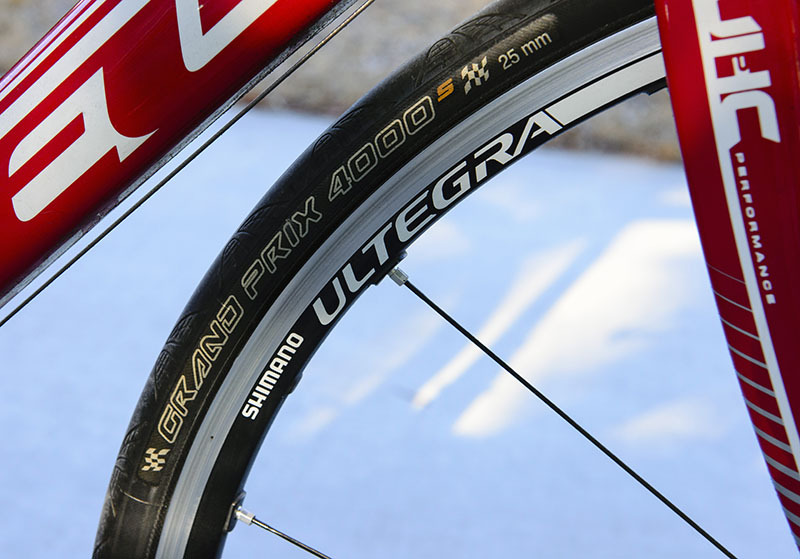 I later replaced the OEM Felt wheels with a set of Shimano Ultegra alloy wheels, which offered better rolling efficiency and a slightly better ride than the Felt wheels. This marked the first time I’d ever changed a major components (seats don’t count), which taught me just how important wheels were to your ride. The Felt turned out to be a great introductory carbon frame. The Shimano 105 drive train shifted smoothly, with even, easily controlled braking. Eventually, I realized I wanted something even a bit smoother. But I also came to appreciate the precise handling and endurance geometry. I knew I wanted to stick with an endurance bike, but step up to something a bit higher end, and a little lighter. At 22 pounds, the Z5 wasn’t a heavy bike by any means, but better frames and components would drive the weight down. I still have a soft spot for Felt bikes, though, even though I ended up with a different brand. As my first carbon fiber frame, the Z5 demonstrated how much different frame materials make. Can AMD Stay In The Game? I can’t believe it’s 2019 and we’re fighting about vaccines (they’re good), the earth (it’s not flat), the climate (it’s warming) and nazis (they’re bad).